Built in 2010, the Chantelle Marie Celebration Hall is the perfect setting for your friends and family to gather for your special event or wedding in Auburn, NY. Our renovated barn and Celebration Hall provide guests with a relaxing, scenic setting on the western shore of Owasco Lake. 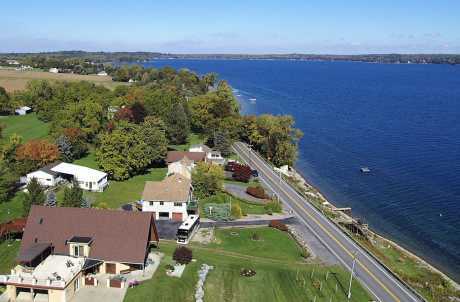 Our venue is located in the heart of the Finger Lakes and is a great complement to our vacation rental, the Chantelle Marie Lakehouse. The antique barn is the perfect setting for smaller events, cocktail hours, and receptions. It features a rustic charm and sets the stage for a perfect celebration. Our tent covered patio offers guests shelter and a beautiful view of the lake. Our yard features a small orchard, vineyard, and pond to provide guests with natural surroundings and a special setting for photographs. The Celebration Hall can accommodate up to 350 guests. We provide the tables, chairs, and ice machine, while clients commission their own caterer. The hall provides clients with a simple, warm and welcoming atmosphere for their special event, wedding, or memorial gatherings.